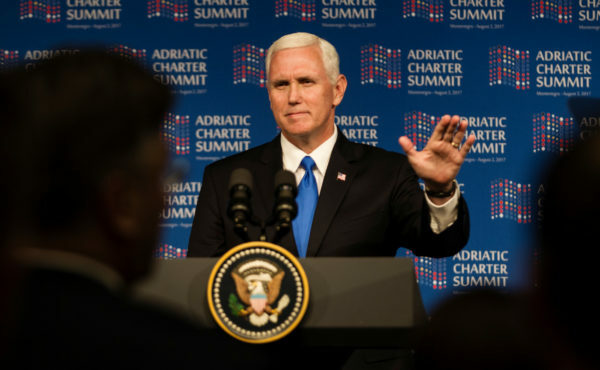 Vice President Mike Pence gestures during a speech at Adriatic Charter Summit in Podgorica, Montenegro, Aug. 2, 2017. “My entire team will continue to focus all our efforts to advance the president’s agenda and see him re-elected in 2020,” Pence said in the statement in which he praised President Donald Trump’s work on job creation, rebuilding the military and fighting terrorism. The statement came in the wake of a New York Times story that detailed early steps that Pence and other Republicans purportedly are taking are consistent with preparing for a 2020 campaign, even though Trump has given no indication that he doesn’t plan to run. The actions, in some cases, have suggested a lack of confidence that Trump will serve out his term or choose to seek re-election. The president has been saddled with job approval numbers that are historically low, and he is facing a special counsel probe of his 2016 campaign. “The American people know that I could not be more honored to be working side by side with a president who is making America great again,” Pence said, asserting that the media has been trying to divide the Trump administration. Kellyanne Conway, counselor to the president, said during an appearance Sunday on ABC News’s “This Week” that she has “zero concern” about a 2020 campaign by Pence. Conway also chided fellow GOP operatives said to be pushing the notion of a 2020 “shadow campaign” to succeed Trump. “Most of the people quoted, most involved, I’m sure, have never won a national political campaign like the one I was involved in and you were involved in years ago,” Conway told Stephanopoulos, who was a top aide to Bill Clinton during his 1992 presidential campaign. “Some of them are still not supporting their party and their party’s main points of view on tax reform, on health reform, on putting [the Islamic State] in retreat, if not full defeat,” she added.